We also offer a variety of enhancements, including hot foot treatments, peppermint scalp massage, and aromatherapy. Our therapists are available seven days a week, and we offer a variety of affordable membership programs so that you can receive the pampering that you deserve. We want you to be able to feel your best. 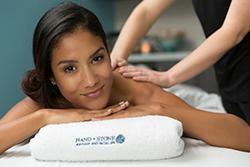 At Hand & Stone, we're committed to maintaining a comfortable and welcoming spa environment. The massages we offer are competitively priced, and we strive to keep our services as accessible as possible. We offer both couples and individual massages and will cater to your needs. Give us a call today to set up an appointment at our spa in Dublin.